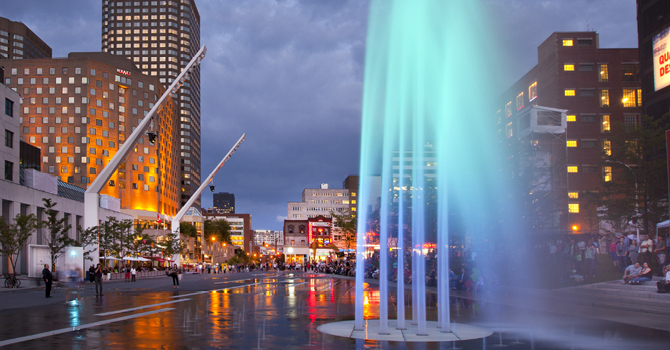 This week, the Quartier des Spectacles Partnership opens its call for submissions for the Luminothérapie 2019-20 competition, marking the initiative’s tenth annual edition. Luminothérapie is Quebec’s most important multidisciplinary competition for temporary participative public art installations. It quickly became one of Montrealers’ most treasured winter events. Creators from all disciplines are invited to animate the Place des Festivals and adjacent projection surfaces with works on the theme of celebration. By choosing celebration as this year’s theme, the 10th annual competition is officially a salute to the exceptional success of Luminothérapie, its works, their creators as a whole over the last decade. To mark the first ten years of the winter event, up-and-coming and established creators are invited to imagine an auditory, luminous and participatory installation for the Place des Festivals, freely inspired by the theme of celebration. Participants must also propose architectural projections for two nearby buildings: UQAM’s Président-Kennedy building and the Wilder Building – Espace danse. The primary work must inspire a sense of wonder both day and night and encourage active public participation, encouraging people to move, meet, talk and have a shared experience in a festive setting. “From the beginning, the Luminothérapie competition established itself on the artistic landscape as a wonderful opportunity to invite artists and creative people of every stripe, with or without experience with public space, to join forces and imagine participatory experiences that transform how people relate to public space in the winter. Over the course of its first 10 years, Luminothérapie has led to the emergence of a true creative niche that values public space as a place for creating and sharing exceptional creative installations,” said Pascale Daigle, director of programming for the Quartier des Spectacles Partnership. The registration form, competition rules and evaluation criteria can be found here.